Graystone Church…8 Years…God is good! 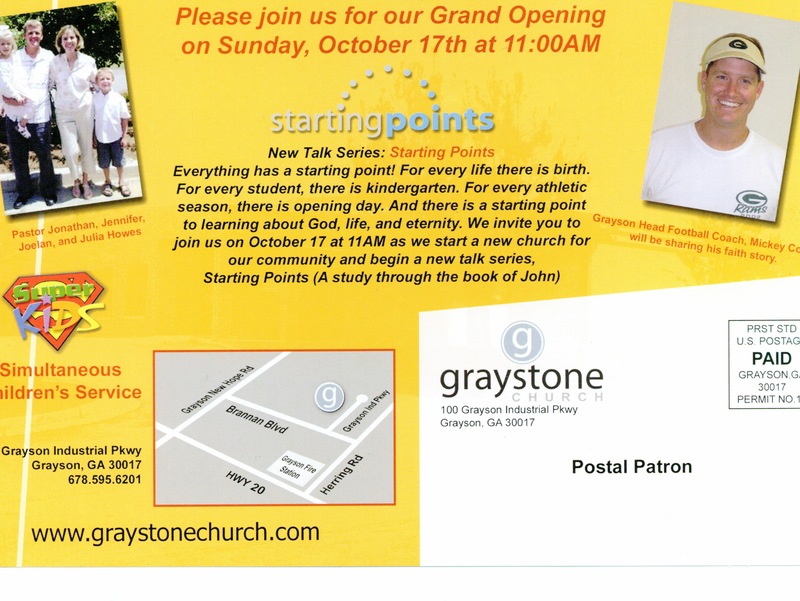 Graystone Church launched 8 years ago today (October 17, 2004) in a rented warehouse space on Grayson Industrial Parkway. I think it’s safe to say that God has done “immeasurably more” than we ever asked or imagined (Ephesians 3:20). I’m so thankful for EVERYONE who has contributed in some form or fashion of your time, talents and treasures to help us “know God and make God known” in our community and around the world. In 8 short years, we’ve seen hundreds of lives changed by God’s grace, and we’ve been able to minister to the needs of those in our community and to the ends of the earth. I truly believe the best is yet to come. Happy 8th Anniversary EVERYONE! It’s an honor to serve God with you. Graystone Middle School relaunches Sunday at 10:30.